Stroke is the leading cause of disabilities and the third leading cause of death in developed countries. In Baden-Württemberg, a prospective planned three level stroke care system was implemented in 2000 following the advances in thrombolytic therapy. It consists of comprehensive stroke centers, regional centers and local stroke units. Accompanying the stroke care concept, a consecutive and prospective database was implemented in 2005 with the legal requirement to register all patients aged ≥18 admitted to a hospital with the diagnosis of stroke (according to their ICD-10 (international classification of diseases, 10th revision) code). The extensive documentation of clinical data - including kind and timing of diagnostic and treatment procedures – allows for the analysis of stroke treatment and outcome of patients in daily clinical routine at different kinds of hospitals. Randomized clinical trials are mainly conducted at dedicated stroke centers, while in daily clinical practice the majority of patients are treated outside these dedicated centers. In addition, inclusion and exclusion criteria used in randomized, controlled thrombolytic therapy trials exclude important patient groups for various reasons (e.g. general approval regulations of health authorities). Thus, one research focus of our group is to analyze outcome of patients treated with thrombolysis in clinical routine. We demonstrated that thrombolytic therapy in daily clinical practice is associated with good clinical outcome in a time dependent pattern (Gumbinger BMJ 2014). Association of thrombolytic therapy with good outcome is comparable between daily clinical routine and data of randomized trials, although in routine, patients were treated with different levels of stroke expertise. Also of interest is the association of thrombolytic therapy in different subgroup of patients (e.g. patients older 80 years or with preexisting disabilities; Reuter Eur J Neurol 2016). A second line of investigation addresses quality in stroke care delivery. We showed that hospitals without stroke units do not provide stroke care with results comparable to hospitals with stroke units, helping decision makers to modify and improve stroke care (Gumbinger Neurology 2016). Future work will focus on the incorporation of recent results from the large thombectomy trials in clinical routine, including the evaluation of thrombectomy in acute stroke in clinical daily routine. Another focus is to develop strategies to provide thrombectomy to a larger population of stroke patients. 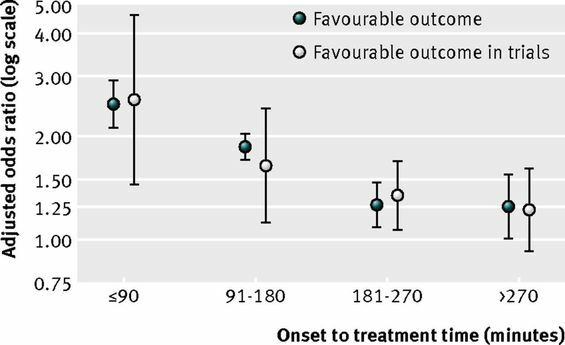 Odds ratio for favourable outcome (score 0-1 on modified Rankin scale) with time to treatment with recombinant tissue plasminogen activator after onset of stroke in binary logistic regression analysis and comparisons with trials (pooled analysis of randomised clinical trials of alteplase for acute stroke (BMJ 2014;348:g3429). Gumbinger C, Reuter B, Wiethölter H, Bruder I, Rode S, Drewitz E, Habscheid W, Daffertshofer M, Diehm C, Neumaier S, Kern R, Ringleb PA, Hacke W, Hennerici MG.. A consecutive and prospective stroke-database covers the state of Baden-Wuerttemberg with 10.8 million inhabitants in Germany. Neuroepidemiology. 2013;41(3-4):161-8.